Please indicate below the emails to which you want to send this article: Show your Spartan pride: "Believe in the G"
Between the end of the spring semester and the joy of commencement, May is an exciting time on campus. This year, UNCG is adding another way to celebrate being a Spartan. On 5.1.14, the entire campus community – students, alumni, faculty and staff – is asked to “Believe in the G.” It’s a day to give to the university and show Spartan pride. “We hope people will make a gift and spread the word about what’s so special about UNCG and why it’s so important to celebrate it,” said Emily Rector, director of annual giving. People can honor the day by wearing blue and gold, making a gift and sharing on social media. These gifts can support any area of the university the donor chooses. Donors can split a gift into monthly installments payable by credit card. Faculty and staff members also have the option to give through payroll deduction. Checks may be mailed to UNCG Advancement Services, P.O. Box 26170, Greensboro, NC 27402, or contributors can give online at believeintheg.org. Those interested in making a gift also can call (336) 334-5988. The first 300 donors to make a gift greater than $52 will receive a free #BelieveintheG T-shirt. 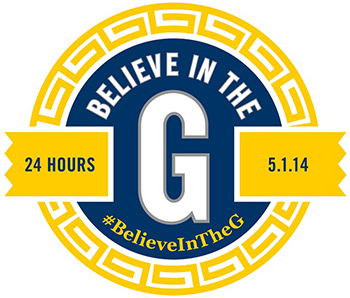 Use the hashtag #BelieveInTheG when telling friends and family what’s best about UNCG on Facebook, Twitter and Instagram. Email photos to BelieveInTheG@uncg.edu to be included in a social media gallery. For those who would like to change their profile photo to support the day, download a 5.1.14 Facebook cover and profile picture. “We want people to share their excitement and enthusiasm,” Rector said. The day is being planned by UNCG Annual Giving Programs in conjunction with UNCG Alumni Relations.